I’m currently planning and making a series of art lessons which will be available on-line. 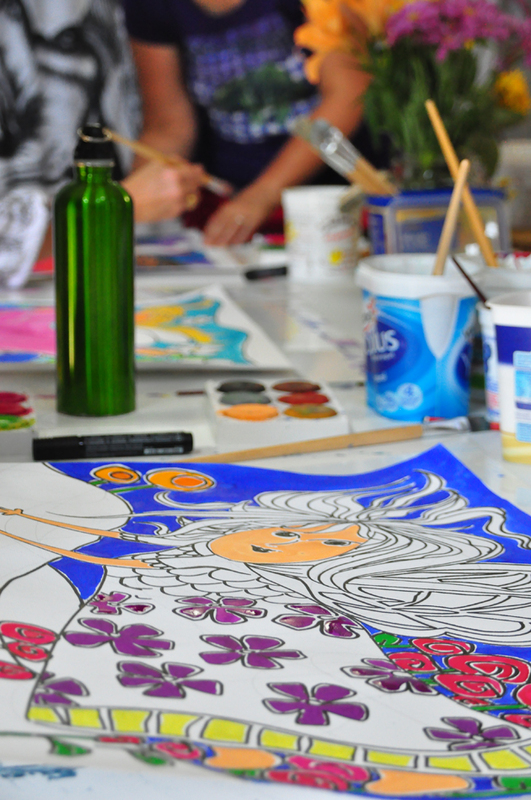 Once that (big) project is done, I’ll schedule selected in-person art lessons/workshops. Sign up to my mailing list to be kept in the loop about both! The following is information about workshops in general. If you’re reading this in October 2017, click this to learn more about the Vision Board workshop I’m running with Yaisa Nio from Yoga Here and There in November 2017. 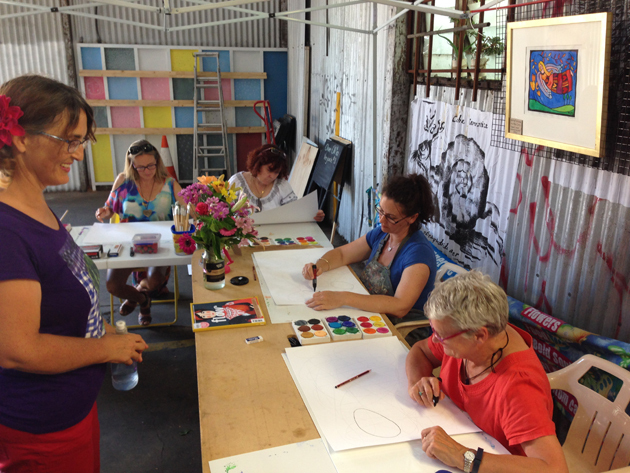 Would you like to do some flavour of Bold Art Workshop with me? Lino Printing is an accessible entry into the bold, graphic world of relief printing, and is rewarding right from beginner level. Coming up soon (in June) is an art workshop series designed to get you from idea to a completed small lino print in 3 steps! The course is structured for you to learn the simple yet effective skills of lino printing, or refresh your existing skills. We’ll break it down loosely as Session 1> Design, Session 2> Carving and Session 3> Printing. Or, if you have a project already started, you can cherry pick one session to move your own project forwards in the company of other makers. This a wonderful series for teachers! Learn skills you can take back to school with you, while you clock up 6 hours of professional development time! Lino carving is great for older secondary students. Selected kinds of relief printing and design skills can be included in curriculums for all ages. The next workshops will be when I can fit them in! Sign up to my mailing list to be kept in the loop! 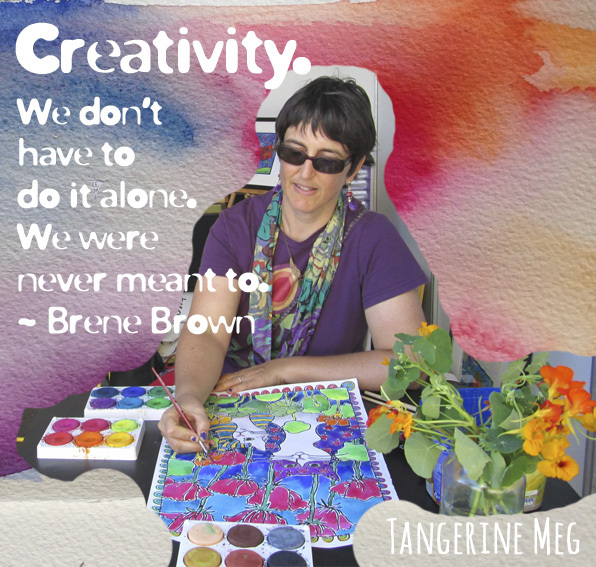 What are your art workshops like, Meg? The next workshops will be in 2017. Sign up to my mailing list to be kept in the loop! Step 1> Design: We’ll start with a printing demonstration – always fun! – then reverse engineer the process so you can make your own print. If you already have an idea for a picture you want to make, bring your idea / design along. Otherwise I’ll have some subject matter as a fall back – I’m thinking succulents for the series that’s about to start in June. I’ll help you fine tune your design – we’ll consider positive and negative spaces, pattern, etc, to make your composition as effective as we can. Then you get to draw up your picture onto your lino block (sometimes called a ‘matrix’!) Note: no previous drawing experience necessary! 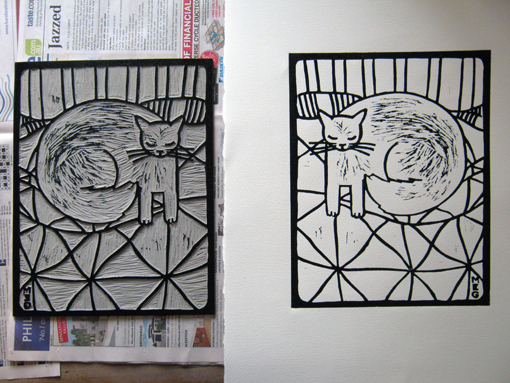 Step 2> Carve: Your design is by now traced onto your own little lino block. I’ll show you how to carve your lino safely (tip: carve away from your hand – those tools are sharp!) leaving the printable areas proud to hold the printing ink in Session 3. Note: This course is best for age 18 and over! Step 3> Print: Printing your design! We’ll roll ink onto the block, apply paper and burnish the back of it by hand (very therapeutic)! Then, after 3 sessions of progress, the most spectacular stage … peeling the paper back and viewing your print! Woohoo! This is when things get spectacular… Gasps of amazement! Curses at letters accidentally back-to-front. Super satisfying! This course covers one-colour, relief printing with black ink – that’s my favourite technique, very graphic, & (I think) best for hand colouring. You can later apply the same principles of relief printing to multi block and reduction block printing. The class sizes will be small (8 student limit for lino classes) so that I can be very attentive to your creative progress and guide you as you go. If you’d like to come to just 1 lesson for a refresher or to progress your own project, simply ‘cherry pick’ your class and book accordingly. Materials to complete a small lino print are included in the lino workshop price. If you fall in love with this medium and want to print more at home, I’ll make some materials/equipment kits available for purchase. I’m researching that now how to do that flexibly and cost effectively. No set homework Just put aside put aside a precious afternoon for yourself, for your sessions. Plan ahead to get to the venue at the time of the class, with a bottle of water and wearing clothes which can happily get a smattering of ink & paint on them or a good protective apron. 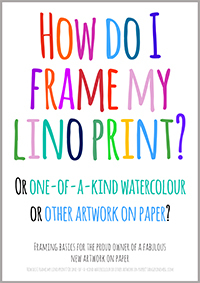 It will be helpful if you have some ideas for your lino print, though I’ll provide subject matter as a fall back. I went to the Ruth Tuck’s quintessential Art School from the age of 7, so I have a lot of experience making pictures; and I’m imbued almost at a cellular level with a love of colour! I started helping Ruth when I was 16 years old, and shortly afterwards began to teach younger students. After completing High School I did a Bachelor of Design (Visual Communication) which was before computers were invented in common use. Later, after a change of pace and 2 boys – teaching for Ruth through almost all of it – I went back to college and did most of another Advanced Diploma in Graphic Design and learned to apply computer magic to my design skills. In person? I smile almost as much as in my photo, though I move more and am more excitable! 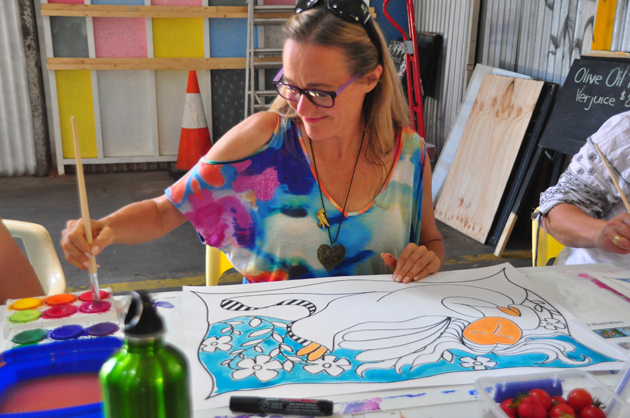 What art workshops are coming up? The next workshops will be in 2017. 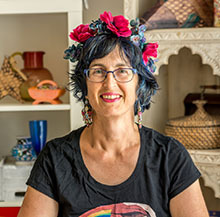 If you’d like to register your interest, sign up for my [Tangerine Juice] Studio eLetters and tick that you’re interested in Lessons, South Australia. You’ll receive first notice when workshops are scheduled. Or, if you’re already on my mailing list: simply find one of your previous emails from me and update your subscription preferences using the link at the bottom & tick the boxes that apply in the section about Bold Art Workshops. Meg, I need to know more! I’d really appreciate if you’d email me any other questions, comments, suggestions; you’ll most likely help other Bold Souls as well as yourself. Also, you’ll be helping me to fill in any gaps!